Beginning in October 2017, stories of sexual assault in the entertainment industry and on Capitol Hill have been uncovered and shared on social media. How do these allegations affect student victims? At 13 years old, Danielle Stevenson was sexually assaulted. She was groped in a seventh-grade classroom by a group of boys at her school. To them, it was a joke. To her, it was a nightmare. According to Stevenson, a pseudonym to protect the student’s identity, “I was sitting in class, it was a normal day. I sat at a table with all boys. I was the only girl there because we had about five girls in my class, so they decided it would be funny to play a game of truth or dare in the middle of class. However, after contacting the school’s administration about what had happened, nothing was done. “It continued … even though I went to the administration and everything, no one did anything about it, so it continued throughout the same class with just things like that happening every day,” Stevenson said. “The teacher that taught the class we were in knew what was happening, he didn’t do anything about it. Half the time I think he sat there and watched it happen and didn’t do a thing. It was pretty obvious what was happening.” Stories like Stevenson’s are not uncommon. Within the past few months, cases of sexual assault have surfaced and spread globally. Actors, businessmen, and government officials alike have been accused of sexual misconduct. The allegations have taken over the media by storm, with new cases popping up every week. Because of these allegations, some celebrities have begun using their influence to spread awareness. For example, actress Gal Gadot, who plays the role of Wonder Woman, refused to star in the Wonder Woman sequel if producer Brett Ratner remained a part of the movie. Ratner has several sexual assault allegations against him, and Gadot succeeded in removing Ratner from all future Wonder Woman productions. 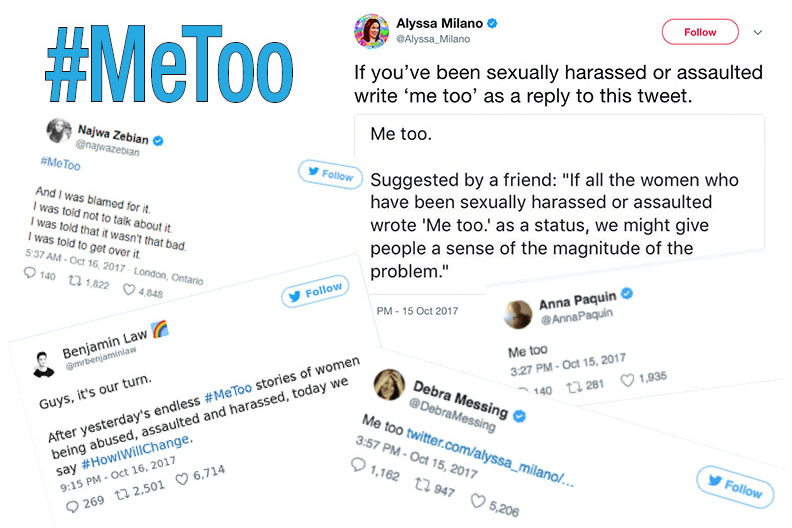 Actress Alyssa Milano also took a stance against sexual assault by raising awareness for victims through Twitter. She suggested that every victim use #metoo to share their struggles and showcase the immense group of people who have been affected by sexual assault. As a result of this suggestion, women and men around the world spoke out not only about recent allegations in the media, but also shed light on personal experiences. According to a survey conducted by The Patriot, 186 out of 196 respondents are informed of the allegations presented in the media. Over 68 percent of students have heard about forty-second president Bill Clinton’s sexual misconduct, over 63 percent of students report recognition of President Donald Trump’s sexual assault accusations, and over 61 percent acknowledged actor Kevin Spacey’s case. Despite the prevalence of sexual assault in the media, some students are hesitant to share their personal stories. Sexual assault remains a difficult subject for victims to discuss. According to the survey, about eight percent of the students have been sexually assaulted themselves, but only one student volunteered to be interviewed. 34 percent of students know a friend or family member who has been assaulted, of which only two people offered to be interviewed. The majority of students, 82 percent, said that sexual assault is a major problem in America, but the remaining 18 percent were skeptical. “It’s a lie. No one has been raped at John Carroll, just a bunch of stupid people who consider [things] they regret later ‘sexual assault,’ ” a student wrote. However, some students shared their experiences with sexual assault in anonymous responses to the survey. “I was unconscious at a party and was touched inappropriately. The only way I knew it happened was through a video,” one student wrote. Taylor Bynion is the Copy Chief and Alyssa Kraus is the co-Editor in Chief of The Patriot and jcpatriot.com.